Come September, and the interior design industry unveils the trends for colours, patterns, and furnishings for the upcoming year. 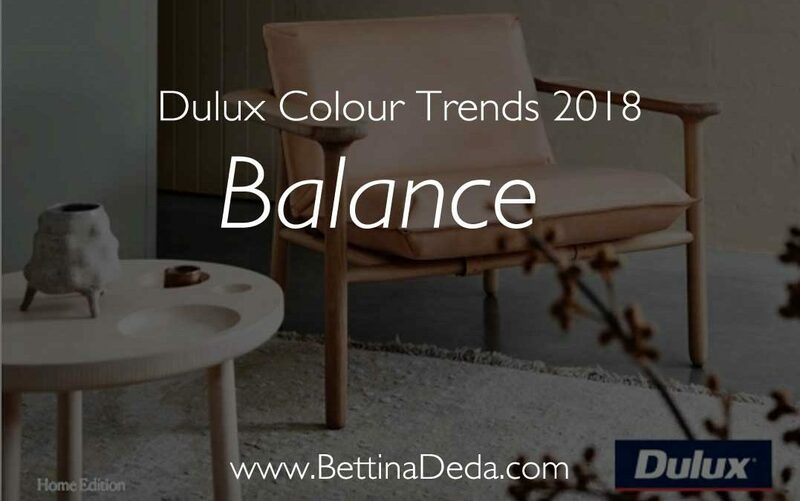 Last week, two trend forecasts hit my inbox, one from Dulux and the other from the German trade show Heimtextil. The Heimtextil Trendtable depicts our urban future in four macro trends (I will cover this international trend forecast in a separate post). This post is all about a new world of colour, which according to Dulux strikes the perfect balance. 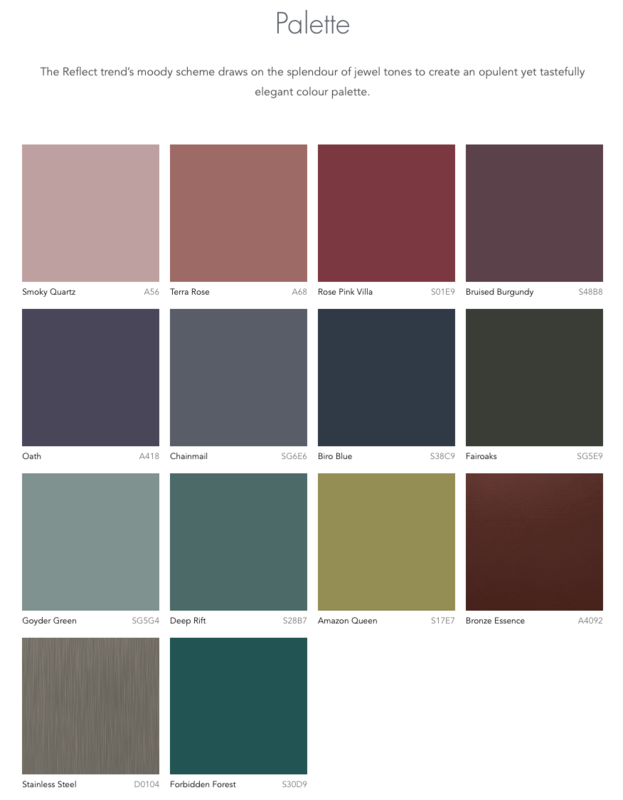 In last year’s forecast Antidote: A Colour Cure, Dulux prescribed colour as the recipe to create harmony, juxtapose the gloss and shine of technical devices with tactility, rawness, and organic materials and find balance and connections in our private life. You can listen to my interview with Dulux Colour Expert Andrea Lucena-Orr in this podcast. A year later, our world has not that much changed; technology still dominates our lives and surely will in the future. Many people try to get away from it all, with more or less success, which explains the birth of several magazines on mindfulness and conscious living in the past twelve months. Plus, the popularity of practicing yoga and meditation seems to be at an all-time high. As we all know that we can’t escape the digital age and have to admit that it clearly has improved our lives in many ways, it’s all about finding the right balance. Apply this rule to all areas of your life, and you will feel more stable and happier. Colour is one of the easiest tools to bring some happiness into your life. 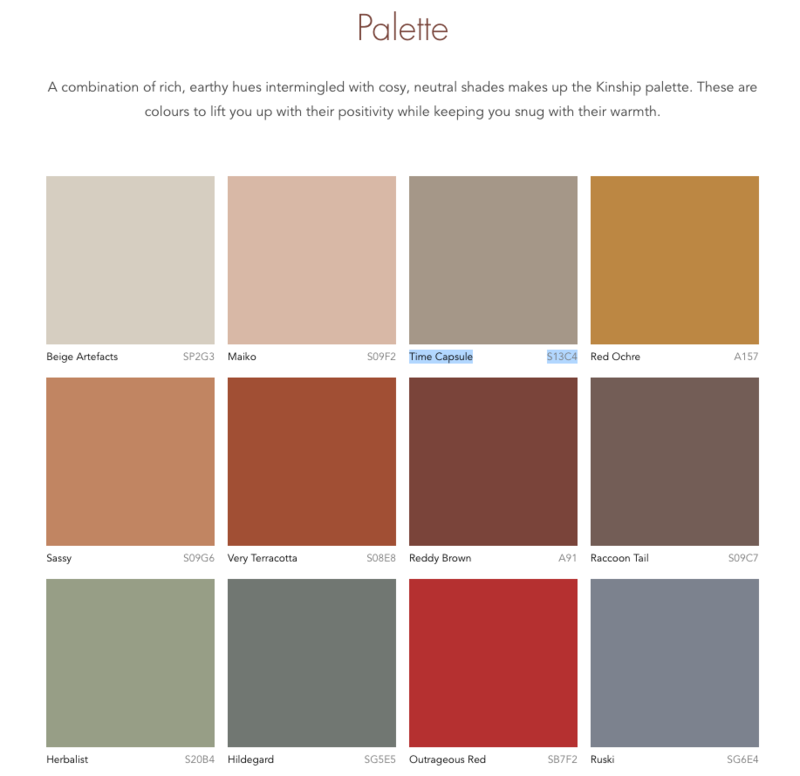 Learn about colour psychology to choose the right colours for your wardrobe and your home. 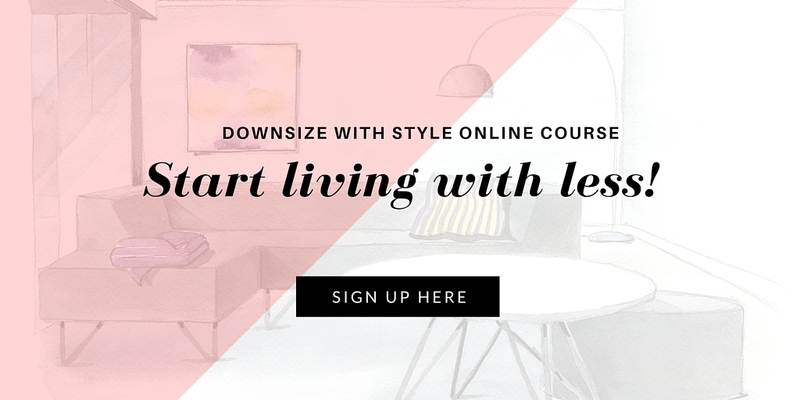 In my four-part serious about colour psychology, I explain the different colour personalities and how, once you know which type you are, your interior will fall into place. Plus, you will discover that you are drawn to the same colours when it comes to clothing. 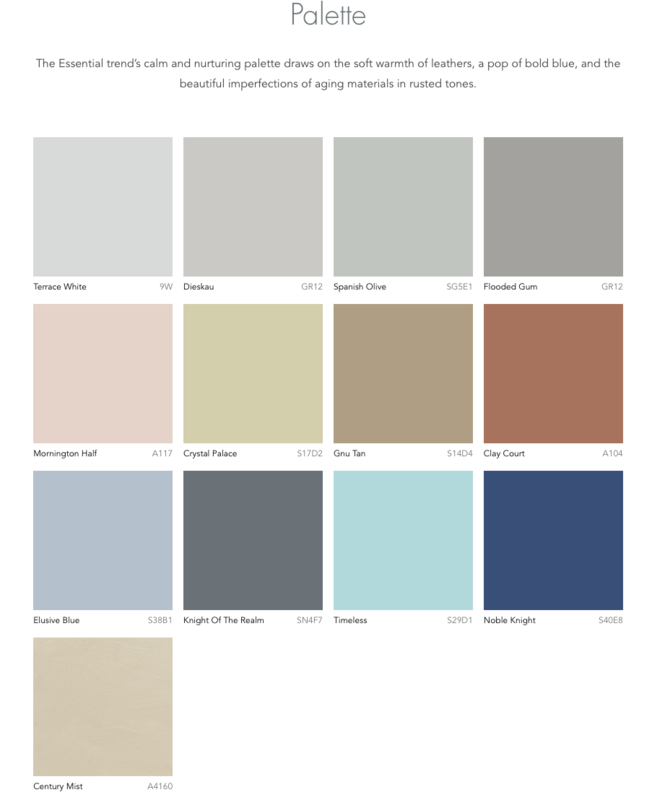 The 2018 Dulux Colour Trends offers the home decorator the perfect balance between balmy neutrals and more vibrant, saturated hues celebrating the juxtaposition of past traditions and future adventures and innovations. It’s all about showing your personality and telling your unique story in your home. Choose the colours that reflect who you are and how you want to live. “Colour is a wonderful way to express our personal taste and passions,” explains Andrea Lucena-Orr to no surprise. If you want to play it safe, have a closer look at this rather muted palette featuring warm shades of leather and cool grey-greens. You can’t go wrong with a soft and peaceful setting to relax and re-energise from the crazy world outside. Although we seem to be ‘on’ 24/7, more and more people seek the real connections, real conversations with other humans. The warm, inviting hues of terracotta, burnt red and faded green invite us to celebrate cultural diversity. Combine subtle neutrals with bolder colours inspired by nature to create an eclectic palette. If you can’t live like the digital nomads of our age, be inventive and escape with the striking colour world of Escapade. 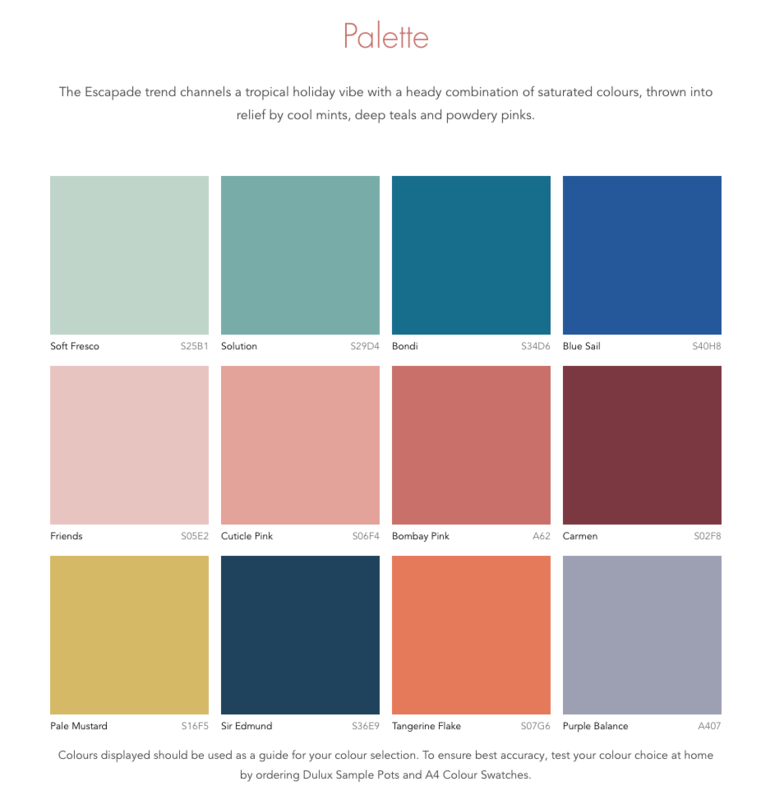 Be courageous and add some saturated, summery brights into your life evoking feelings of beach life and cocktails by the pool. This palette is all about fun, adventure and bringing some zest into your day. And if at some point in time you want to pair back, you can always repaint. Retro, vintage, and old wares are more popular than ever. Reflect reminisces the good old days celebrating the 1970s glamour and 90s swagger but adding a modern twist. Think rich, decadent greens, greyed-off purple and burnt rose to achieve a moody palette that oozes style and elegance and will surely be a conversation starter. What is your favourite palette? Although I like the neutral Essential palette because it is so easy to live with, I totally adore the elegance and style of the Reflect palette. Browse the Dulux consumer magazine to dive into the world of colour 2018. 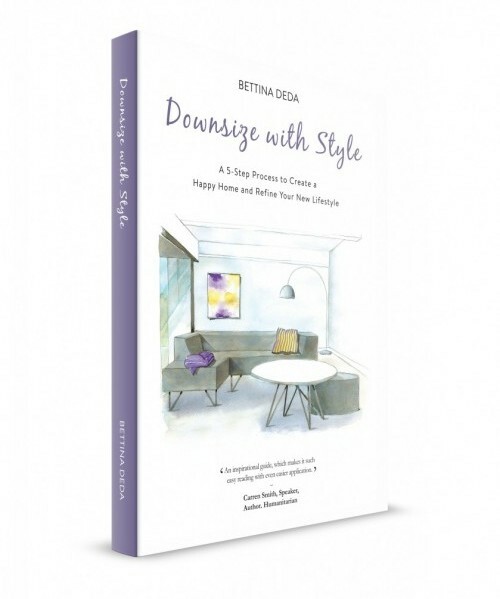 If you want to read more about decorating with colour, get your copy of Downsize with Style today! You will find a whole chapter on interior decorating. Thanks for the color ideas. Much appreciated.